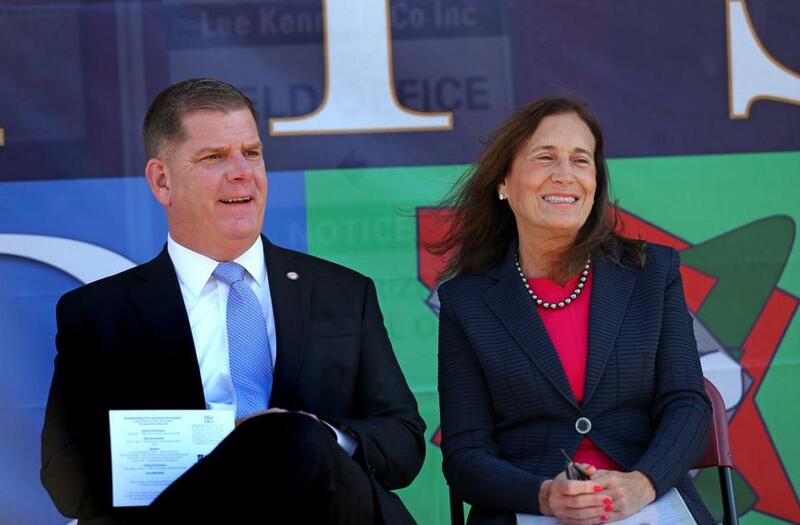 Mayor Martin J. Walsh and State Treasurer Deborah Goldberg. State Treasurer Deborah B. Goldberg on Tuesday announced SeedMA Baby, the first statewide savings account program that aims to put children on the pathway to saving for college. Goldberg said the program will guide parents through the process of opening what is known as a 529 account, which provides tax advantages for future education costs. The program will also contribute the first $50 to the account for parents and guardians of children born or adopted on or after Jan. 1, 2020. “We are empowering the next generation of Massachusetts residents,” Goldberg said during a State House news conference that included Mayor Martin J. Walsh. Private donations, rather than taxpayer money, will be used to fund the program, Goldberg said, including an initial $300,000 donation Tuesday from the Hildreth Stewart Charitable Foundation. The process will be set up through the Massachusetts Educational Finance Authority and will be financed by the Economic Empowerment Trust Fund. Walsh, who created a similar program in Boston in 2014, said statistics show that such programs do help moderate and middle income children go to college: Children who had an account at a young age were three times more likely to go to college and four times more likely to graduate than those who did not. Supporters of the program said the data was based on children who started with $500 in their accounts. At the least, Walsh said, the program educates parents about the importance of such accounts and how they work. “It’s going to show young kids that college is possible, and the community believes in you,” Walsh said. Goldberg’s challenger in the Nov. 6 election, state Representative Keiko Orrall, said in a statement Tuesday that a pilot program Goldberg established two years ago “flopped,” with only 100 families of kindergartners signing up, saving only a fraction of the costs to run the program. She called Goldberg’s announcement Tuesday a publicity ploy. Goldberg downplayed the accusation, however, saying the pilot program was established to test what components of the program work best, and why. The new program will target families of newborns and children who were just adopted.